Location: Near Kirchberg am Wechsel. Open: April-October, 1.5.-30.9 daily, April+October Sat,Sun,Hol, 9-17. Tours at 9:30, 11, 13:30, 15, 16:30. Classification: Karst cave, Mesozoic limestone. Dimension: L=4,277m, VR=78m, T=7°C, A=660m asl. Guided tours: D=45min., extended tour D=75min. 1790 a small boy fell into the shaft called Teufelsloch while hunting pigeons. 23-JUN-1836 first exploration by the writer J. A. Krickel. 1838 report of the first exploration published. 1843 exploration, buy and development by Hermann Steiger von Amstein. 1844 sold to Freiherr von Dietrich. 1845 first description of the cave now called Hermannshöhle. 1869 book Der kundige Begleiter in der Hermannshöhle by Dr. R. Hellbach. 1871 new leaseholder R. Schlosser developed new parts of the cave. 1895 new leaseholder M. Donhauser, owner of the Restaurant Zur 1000jährigen Linde. 1922-1926 new parts found by cavers from Vienna. 1940 new parts, called Kyrlelabyrinth, found by two boys from Kirchberg. 1968 bought by the caving club Hermannshöhlen-Forschungs- und Erhaltungsverein. 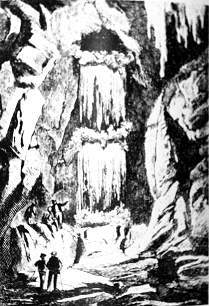 Image: Flow stones called Spitzenvorhang (curtain of lace) from the book Der kundige Begleiter in der Hermannshöhle by Dr. R. Hellbach (1869). The Hermannshöhle has two natural entrances, one called Teufelsloch (Devils Hole) high on the Eulenberg and a second one on the east slope called Windloch (Wind Hole). 1790 a small boy fell into the shaft called Teufelsloch while hunting pigeons. After his rescue the Teufelsloch was also called Taubenloch (Pigeon Hole). The first exploration of the Teufelsloch by the writer J. A. Krickel in 1836 was published two years later. He explains that he descended 66 Klafter (ca.125 m) into the shaft. On the second exploration 1843 Hermann Steiger von Amstein, the custodian of castle Feistritz, found the link to the Windloch. He was very impressed by the cave, so he bought the whole area and the right to develop the cave. He started developing the cave immediately, but he didn't have enough money to complete it. 1844 he had to sell the cave to his employer, the owner of Burg Feistritz, Freiherrn Von Dietrich. But the name Hermannshöhle after Hermann Steiger survived. The Eulenberg or Eigenberg (740 m) lies nortwest of Markt Kirchberg am Wechsel. On top of granites and slate lies a 1 x 2km large area of slightly metamorphic Mesozoic limestones. There are two different tours in the cave. The extended tour includes the Kyrle-Labyrinth, which is richly decorated with sinter formations.